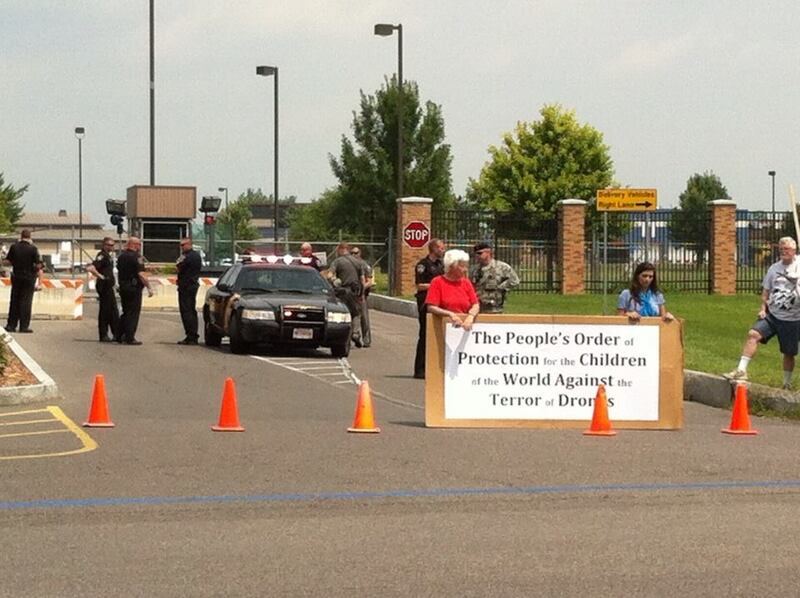 The group blocked the entrance to the base and took up positions for vigil. Brian Hynes, NYC Catholic Worker, was allowed to vigil on the side of the main entrance, usually prohibited. Seven from the group – from Vermont, Maryland, New York City, and Ithaca – were arrested. The seven activists were charged with Trespass. Two of the defendants, Clare Grady and Martha Hennessy, were also charged with Violation of an Order of Protection. Liz McAlister and Erica Brock were charged with Disorderly Conduct. Clare Grady and Martha Hennessy are being held on $10,000 bail. Felton Davis, Erica Brock and Joan Pleune are being held on $2500 bail. Liz McAlister and Bill Ofenloch were released on their own personal recognizance. All of the defendants are scheduled to appear on August 6th. Three of those arrested are grandmothers. 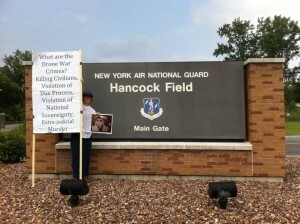 On July 10th, 2014, drone activist and grandmother Mary Anne Grady Flores was sentenced to one year in jail for violation of the same order of protection, taken out on behalf of the Colonel of the base. She is currently out on $5,000 bail pending appeal. A higher court has found the order to be invalid. 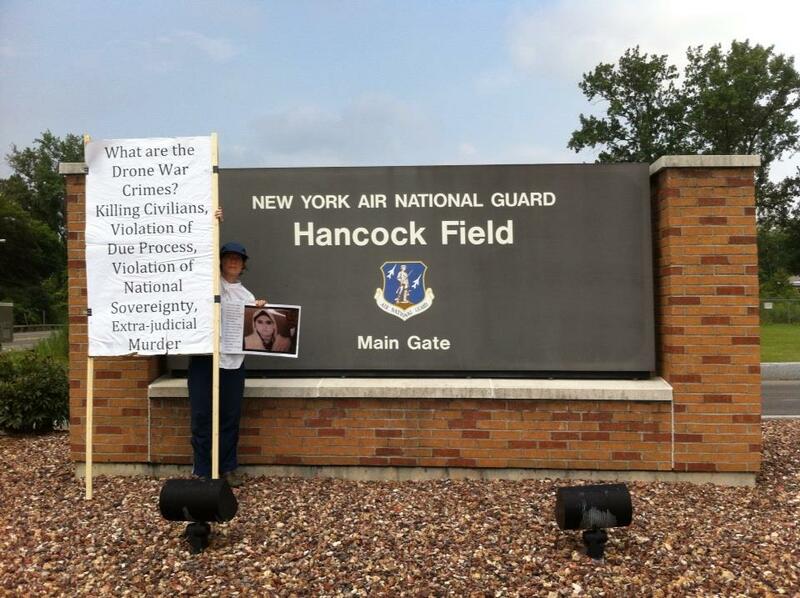 The Upstate Coalition to Ground the Drones and End the Wars is made up of anti-war organizations and formed around resistance to the MQ-9 Reaper Drone program at Hancock Field Air Force. Syed Wali Shah 7 years old, killed by an American Drone strike. Momina Bibi, mother and midwife, killed by an American drone strike. Tairk Aziz, 16, killed by an American drone strike… This Must Stop! We, members of the Atlantic Life Community, come to Hancock Air Force Base, the national maintenance and control center of the MQ9 Reaper Drone, to protest these lethal drones, the latest weapon being used in endless war. We are a community of peacemakers who resist war, racism and greed. We stand here today in solidarity with the men, women and children being terrorized by U.S. military aggression. Our witness mourns the senseless deaths of our brothers and sisters, victims of drone strikes from this base and adds our voice to all people of the world who cry for peace. Today we deliver to the base two important documents central to our witness: a war crimes indictment addressed to President Obama, Secretary of Defense Charles Hagel, the full military chain of command, and the local police and Sheriffs Department of the Town of De Witt, NY. By continuing to protect the war crimes of drone warfare, these public officials perpetuate a legacy of violence and racism first imposed upon indigenous people on this land. 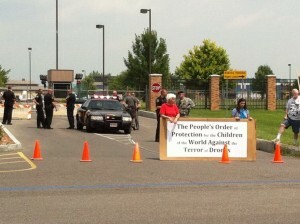 The second document is a People’s Order of Protection, which asks the 174th Attack Wing of the Air National Guard to stay away from the Children of the World and their families, including their homes, schools, places of play and work. The terror and bloodshed caused by the Reaper drones lies on all of our shoulders. As Thomas Merton once wrote, “if you love peace, then hate injustice, hate tyranny, hate greed – but hate these things in yourself, not in another.” Therefore, we come to the gates today in atonement for our complicity in these crimes and to resist the atrocities of drones, to resist our nation’s endless wars and to cultivate a culture of love and not fear.